The following examples were obtained using the volumetric EPSI sequence at 3 Tesla. The whole-brain MRSI acquisition enables comprehensive mapping of multiple metabolites. This following example is for a grade III astrocytoma, and the result illustrates mapping of choline, glycine and lactate, which are markers of actively growing tumor tissue. This data was obtained in collaboration with Dr. RK Gupta. B. Roy, R.K. Gupta, A.A. Maudsley, R. Awasthi, S. Sheriff, M. Gu, N. Hussain, S. Mohakud, S. Behari, C.M. Pandey, D. Spielman, J.R. Alger. 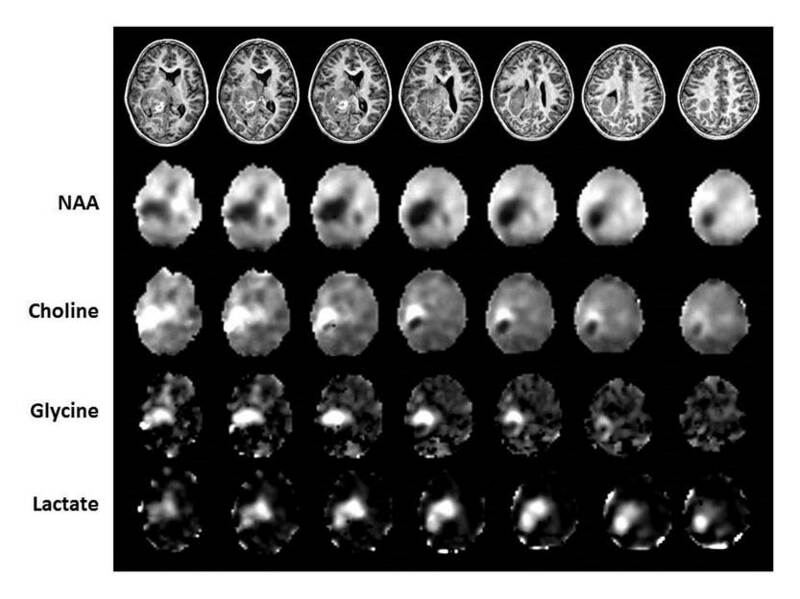 Utility of multiparametric 3T MRI for glioma characterization. Neuroradiology. 55:603-613 (2013). A.A. Maudsley, R.K. Gupta, R Stoyanova, N.A. Parra, B. Roy, S. Sheriff, N. Hussain, S. Behari, Mapping of glycine distributions in gliomas, AJNR, 35(6):S31-36 (2013). 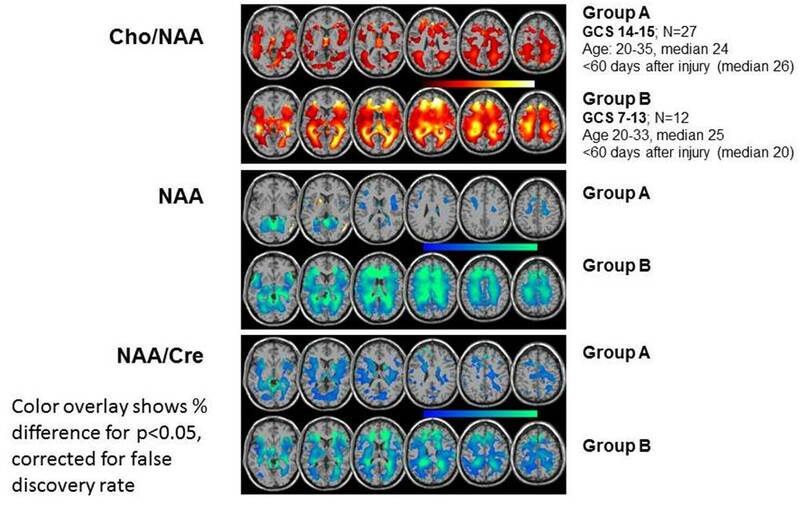 Z-score maps indicating reduced NAA in subjects with Amyotrophic lateral sclerosis relative to age-matched controls. Images are scaled relative to the variance of the normal subject group. Light-blue voxels indicate a significant reduction of NAA. Data courtesy of Drs. Govind and Sharma. MRS can detect altered metabolite levels following traumatic brain injury. This image shows the distributions of altered metabolites in a group of subjects with minimal injury (Group A) and with moderate injury (Group B), relative to control values. Changes of Cho/NAA can be increased as much as 40% relative to normal values in the moderate injury group. AA Maudsley, V Govind, B Levin, G Saigal, S Sheriff, and L Harris. 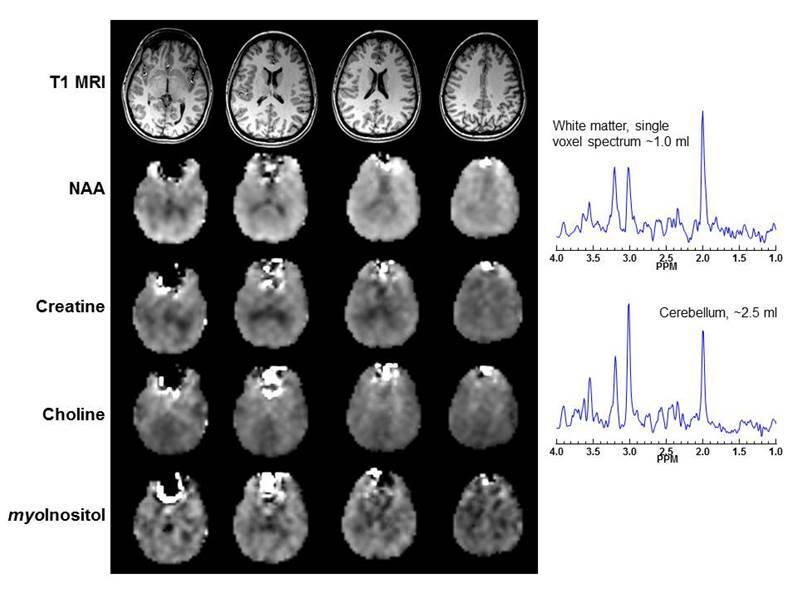 Distributions of Altered MR Diffusion and Spectroscopy Measures with Traumatic Brain Injury. J. Neurotrauma, 32(14):1056-1063, (2015). Maudsley AA, Govind V, Saigal G, Gold SG, Harris L, Sheriff S. Longitudinal MR spectroscopy shows altered metabolism in traumatic brain injury. J Neuroimaging. 2017 27(6):562-569. A.A. Maudsley et al. Associations of age, gender, and body mass with MR-observed brain metabolites and tissue distributions. NMR in Biomed. 25(4):580-93 (2012). All metabolite values are signal normalized, i.e. are directly comparable between subjects and across data obtained at different times. Note the absence of artifacts from subcutaneous lipids that are a concern for standard MRSI implementations. The speckled region in frontal brain represents areas where spectral quality is inadequate due to local magnetic susceptibility effects. X-Q Ding, AA Maudsley, S Sheriff, M Sabati, PR Dellani, H Lanfermann. 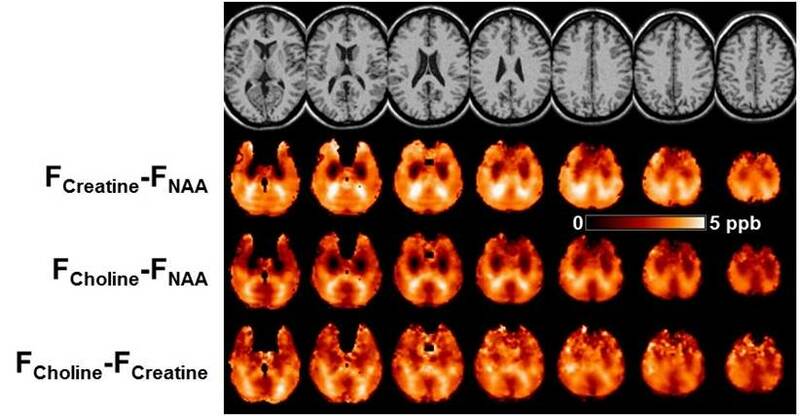 Reproducibility and reliability of short-TE whole brain MR spectroscopic imaging of human brain at 3T. Magn. Reson. Med. 73(3): 921-928 (2015). The variations seen in this image additionally reflect the relative orientation of the white matter tracts with respect to the direction of the B0 field. Maudsley AA, Goryawala MZ, Sheriff S. Effects of tissue susceptibility on brain temperature mapping. Neuroimage. 146:1093-1101 (2017). Maudsley AA, Goryawala MZ, Sheriff S. Association of NAA Resonance Frequency with Axonal Orientation. Proceedings ISMRM, Honolulu, p 5445, (2017). One advantage of having fully volumetric MRSI information is the ease of coregistration to other imaging modalities. 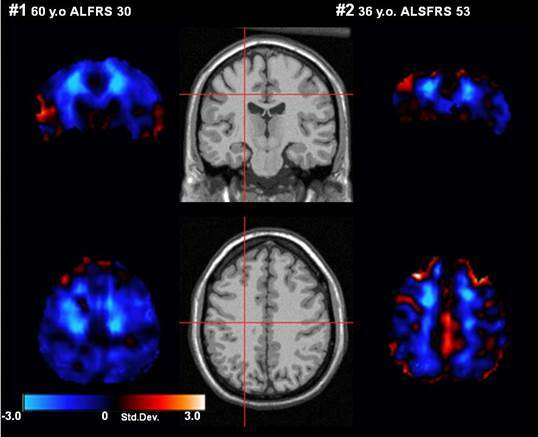 The following example shows a FET-PET study and a MRSI result for an Astrocytoma grade II brain tumor. 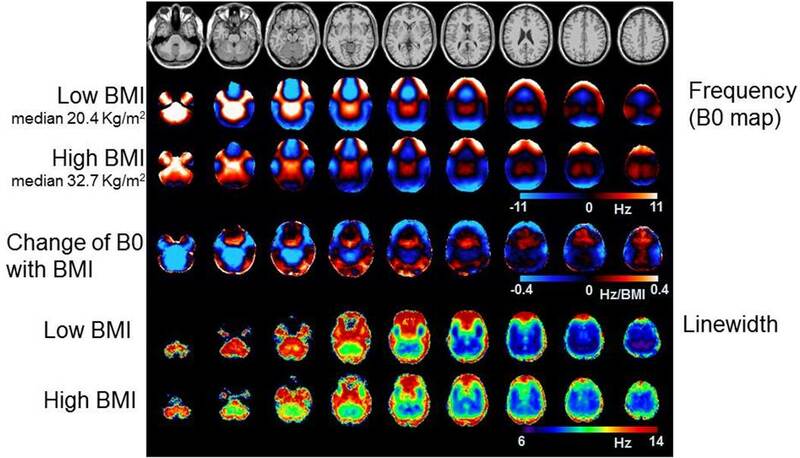 Data were acquired simultaneously using a hybrid PET-MRI scanner. Data courtesy Drs. Shah and Langen, Jülich Research Center, Germany. J. Mauler, A.A. Maudsley, K-J. Langen, O. Nikoubashman, G. Stoffels, S. Sheriff, P. Lohmann, C. Filss, N. Galldiks, E. Rota Kops, N.J. Shah. 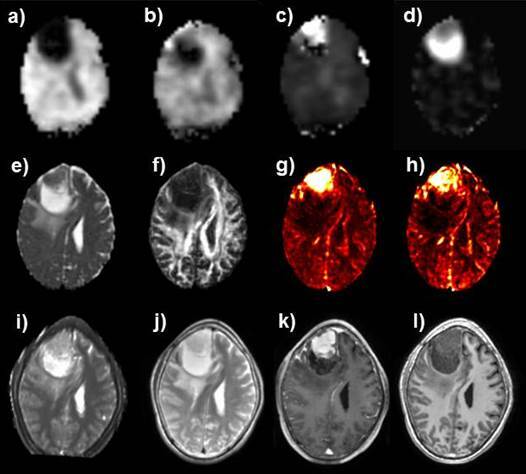 Spatial Relationship of Glioma Volume Derived from FET PET and Volumetric MRSI: a hybrid PET-MRI study. J. Nuc. Med. Epub Aug. 28 (2017).